Venissa's rows of Dorona vines grow in the shadow of an ancient bell tower. I have visited lots of “extreme” terroirs—from mountainside sites harvested with the help of helicopters to cliffside vineyards dangling above the sea, but nothing matches the Venetian lagoon. Venissa, the quixotic wine project started by the Bisol family of Prosecco renown, is now in its 10th vintage on Venice’s Mazzorbo island, adjacent to Burano. It has taken an investment of more than $11 million—for recovering and replanting Venice’s obscure white Dorona variety, building a small wine resort with a Michelin-starred restaurant, and even buying an island for more vineyards—but the project is now breaking even under Matteo Bisol, 31, the eldest member of Bisol’s Millennial generation. The project began with the obsession of Matteo’s father, Gianluca Bisol, president of Bisol, now owned by the Lunelli Group. It’s “crazy” not only because of the small quantities of wine made, but also because of the perpetual threat of flooding by brackish lagoon water with salt levels considered toxic to vines. Repeated flooding on the lagoon's small islands had nearly eliminated viticulture in the area until Gianluca Bisol started Venissa. He points out signs of ground salt, evident in the types of natural ground cover or in the lack thereof. The lagoon’s brackish waters sit about 30 inches below the surface, meaning vines need to be planted to have enough room to grow horizontally in search of fresh water. Matteo Bisol plans to expand the vineyards, and then possibly make wine on the island. Venissa’s story began 17 years ago, when Gianluca was visiting the historic medieval church on nearby Torcello island and saw vines in a small garden. Gianluca was fascinated: Viticulture in Venice? He talked to the owner, who pointed him to three Dorona vines growing on their own roots—a rarity today when nearly all vines are planted on phylloxera-resistant rootstock. Gianluca contacted a historian friend and began researching. Venice made local wine for millennia—most recently on the sparsely populated smaller islands that still serve for growing produce. Dorona, a descendant of Garganega, the main grape in Soave, was one of the few local varieties that survived. 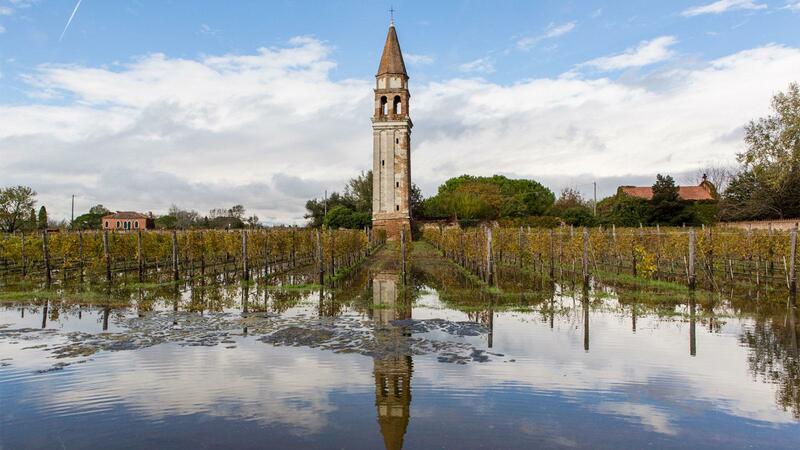 Most viticulture was wiped out in the 1966 flood—considered the worst in Venice’s history—when high tides, winds and heavy rains conspired to raise waters more than 6 feet. But Gianluca discovered more than 80 other Dorona vines around Venice. He also found an abandoned vineyard and winery on Mazzorbo that had produced wine for nearly a century before the ’66 flood, after which it fell into the hands of Venice’s city government. Gianluca obtained a long-term lease, planting a Dorona vineyard with propagated cuttings beginning in 2006. A freshwater well was dug to more than 600 feet—not to irrigate vines in the classic sense but to help flush away salt after periodic light flooding. Tuscan wine consultant Roberto Cipresso vinified the first vintage, 2010, in Montalcino, making 3,000 half-liter bottles. From the start, Bisol and Cipresso decided to make a skin-contact white; a weeks-long maceration was traditional for Dorona, allowing the wines to withstand summer heat in a place with no underground cellars or refrigeration. Gianluca, who wholly owns the Venissa project, went to great lengths with the packaging for the wine: Each year, a different minimal design is scratched into a sheet of gold leaf that serves as a label. The vintage is etched into the glass. The $160 price tag makes the wine sustainable, Matteo says. Minimalist design, maximum luxury: The labels are created from gold leaf. The wine, which has the mouthfeel of a red and is characterized by bittersweet notes and saltiness, has developed fans on both sides of the Atlantic. Since 2011, Venissa has also produced a Merlot-Carmenère red, as well as a second red under the Venusa label. Both are sourced from a late-1960s-era, 7-acre vineyard rented from the Swarovski crystal family on their private island, Santa Cristina. In 2012, Gianluca followed up by buying a 15-acre deserted island, Isola del Pra, divided from Mazzorbo by a small canal. Planting of the first 3.5 acres is scheduled to start this month. Some of Matteo’s innovations include brewing a Venusa beer with local herbs and opening a year-round, casual osteria a few steps from Venissa’s seasonal, vineyard-edge, gastronomic restaurant. Both are run by executive chef Francesco Brutto, a young star chef from Treviso known for cooking with a light hand and using wild local plants. While the high-end restaurant closes for the winter season, a more casual dining spot overlooking the vines is open year-round. These days, after the harvest is transported by boat to the mainland, fermentation takes place in the Maeli winery (in which Gianluca holds a controlling interest), nearly 40 miles southwest of Venice. The wines are aged up to three years in cement tanks in rented space nearby.